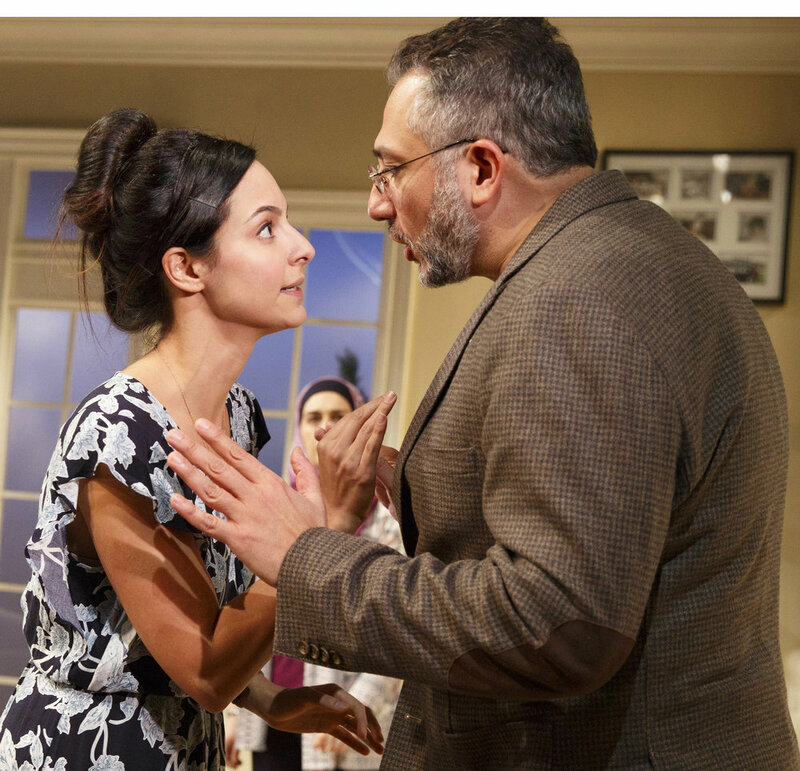 Act I is set in the home of the Almedin family, headed by Raif (Ali Reza Farahnakian), a novelist whose well of talent is stagnating and whose attitude reflects frustration. He and his wife, Naja (Heather Raffo, looking unaccountably more WASP than Levantine), are about to meet their daughter Emina’s new boyfriend—there’s a hint that it’s Thanksgiving, since turkey is mentioned—and Raif, who has renounced his Muslim roots, is deeply unhappy that his prospective son-in-law comes from a devout Muslim family. His secularism is active: he bridles at any show or inclination of adherence to fundamental Muslim doctrine, and his worldliness embraces even the lesbianism of his other daughter, Aisa (Francis Benhamou), although there’s a sense that he wants not to know too much. Ali Reza Farahnakian (left) is Raif, and Babak Tafti plays Sam, his prospective son-in-law, in Zayd Dohrn's The Profane. Top: from left: Farahnakian, Francis Benhamou as Aisa, Tafti, and Tala Ashe as Emina. When Emina arrives with her fiancé, Sam, Raif behaves with aloofness bordering on rudeness. 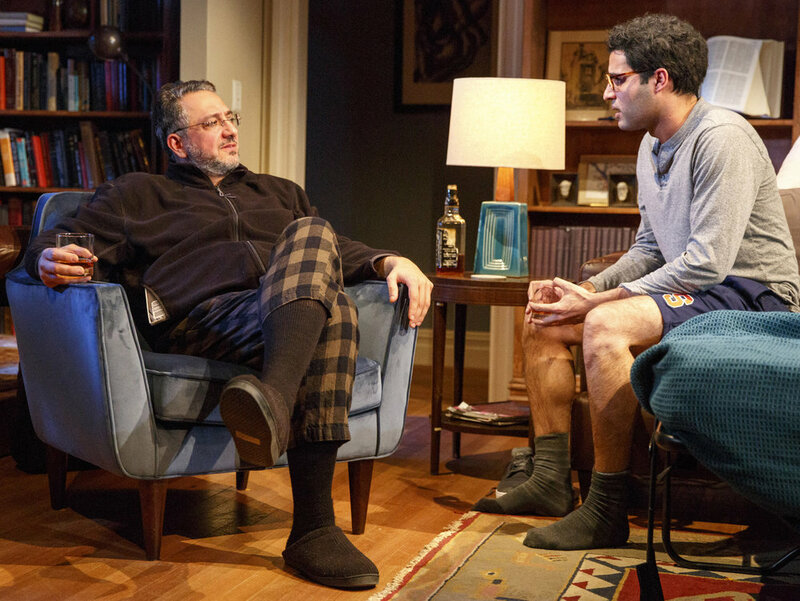 The resonantly voiced, terrifically likable Babak Tafti as Sam is almost too good to be true (as Sidney Poitier was in Dinner), and Kip Fagan's production seems tonally off as Raif alternates between abrasiveness and reluctant comity. For all his “modernism” and disdain for Muslim practices, Raif expects Naja to do the shopping, and he’s clearly not a cook of any sort. He cavalierly violates the fundamental laws of hospitality prevalent in Arab countries, especially those with Bedouin populations, and he won’t even shake Sam’s hand. Aisa: Pa doesn’t deserve this. I don’t bring people I’m sleeping with home to meet my parents. Aisa: Exactly! Why make them suffer? Act II, in the springtime a few months later, introduces the Osman family as they prepare to meet their son Sam’s future in-laws. Ramsey Faragallah’s ebullient, booming-voiced Peter is a traditional Middle Eastern paterfamilias, and his wife, Carmen (Lanna Joffrey) is a more traditional wife, fretting over the impressions they are about to give to Emina’s parents, who are about to arrive for their first meeting. Peter is almost too good to be true, reveling in his ability to provide hospitality in a way that will ring true to anyone with Middle Eastern roots. Indeed, Dohrn gets many details right, especially about food: from the great quantities laid out to entertain guests, to discussions of butchering lamb and sourcing food from farms, to the simple pistachios, a favored snack, placed before Sam at Emina’s home. Emina and Raif argue at the Osmans' home. Photographs by Joan Marcus. But what transpires at the Osman home is so brutally uncivil that one’s sympathy with Raif, already shaky, dissipates quickly, though it is a surprisingly fractious Naja who starts the downhill slide. She makes a discovery and will hear no explanation for it, and one senses the playwright’s thumb on the drama. Whether Dohrn intends to write for balance—both secular humanism and religious devotion can be defended—is uncertain, but the outcome is stacked on the Osmans’ side, intentionally or not. Raif: They hold themselves apart! In their little enclave. They keep to their tribe. Emina: And those people aren’t your tribe? Raif: “Those people” are artists and academics and intellectuals from all over the world. Emina: And are any of them poor? Uneducated? Do any of them not read The New Yorker, Pa? Although the plotting occasionally jars, much is helped by superb acting, especially from Tafti and Ashe’s loyal, articulate Emina, and Faragallah’s hearty patriarch. And the freshness of two different Muslim families being at the center is an effective hook. If Dohrn’s ambitions outstrip his execution, he still provides an evening with much to chew over. 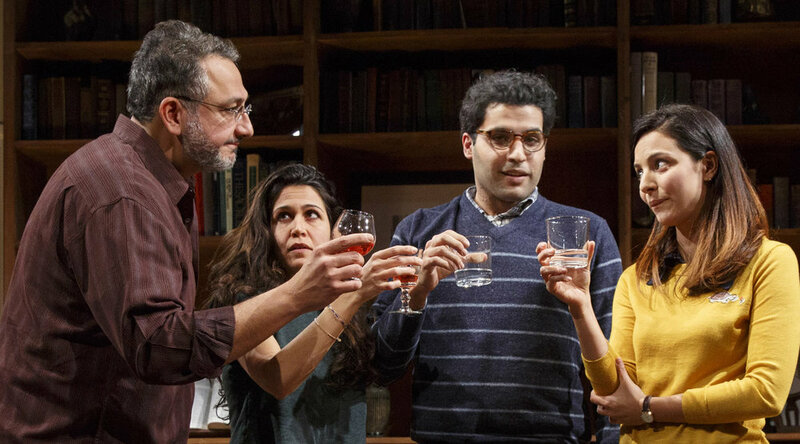 Zayd Dohrn’s The Profane runs through May 7 at Playwrights Horizons (416 W. 42nd St.). Evening performances are at 7:30 p.m. Tuesday through Saturday and 7 p.m. on Sunday; matinees are at 2 p.m. Saturday and Sunday. For tickets and information, call Ticket Central at (212) 279-4200 or visit playwrightshorizons.org.